From Taiwan’s chain of toilet themed eateries, to Bangkok’s Cabbages and Condoms restaurant; adventurous foodies have plenty of choice when it comes to weird and wonderful themed dining experiences. But where should the line be drawn? And is it inappropriate to christen a pop-up burger bar after the most notorious drug lord in history? 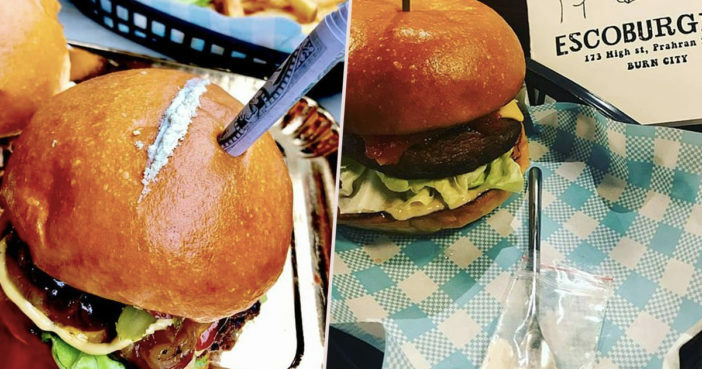 Like many other cool and contemporary burger joints, Pablo’s Escoburgers in Prahran, Melbourne, boasts bulging burgers held together by wooden sticks and plastic trays of golden fries. However, these burgers differ from others you might try at your local trendy bar in a very distinctive way. For example, ‘The Patron Burger’ comes complete with a line of white garlic powder on the bun – intended to resemble cocaine – and a (fake) rolled up $100 note. The burger is served alongside a plastic bag filled with more garlic powder, complete with a silver spoon. A clear homage to the infamous Pablo Escobar, this dish has come with a side order of divisiveness. 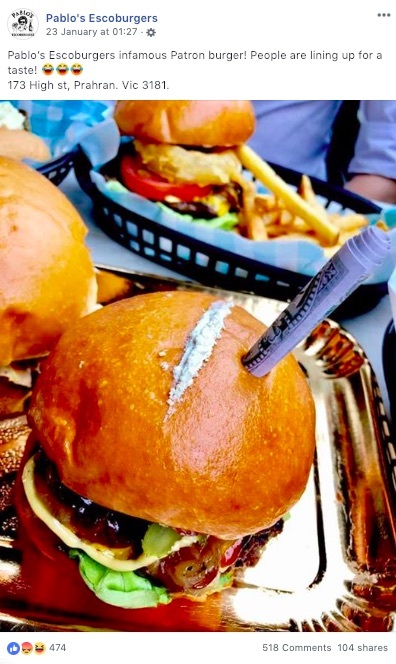 As tasty as the Patron Burger may be, this very obvious allusion to the ‘King of Cocaine’ has led some burger lovers to regard the bar owners as being ‘naive’ to the pain and fear Escobar caused during his reign of terror. And now you have the audacity to be talking on behalf of all Colombians by saying they all love your burgers? Glorifying drug addiction and joking about it through your presentation methods is really stupid and insensitive. One person pointed out that the bar might be less likely to poke fun at crimes which had taken place closer to home, while another described the presentation as being ‘in poor taste’. However, others have rushed to Pablo’s Escoburgers’ defence, praising the clever wordplay and ‘epic design’. Snowflakes, petals and the easily offended. When did you lose your sense of humour? It’s a play on words FFS. With a cheeky visual prop. Don’t take life so seriously. None of us get out alive. We are very proud of our burgers but we do also understand that Pablo Escobar was a horrible man who destroyed the lives of thousands of Colombians. We do not condone, idolise or promote Pablo Emilio Escobar or his actions in anyway. We are however Australian and know how to have a laugh about a good play on words. Its just a name of a pop up burger bar not really a theme. Hard not to offend someone in 2019. 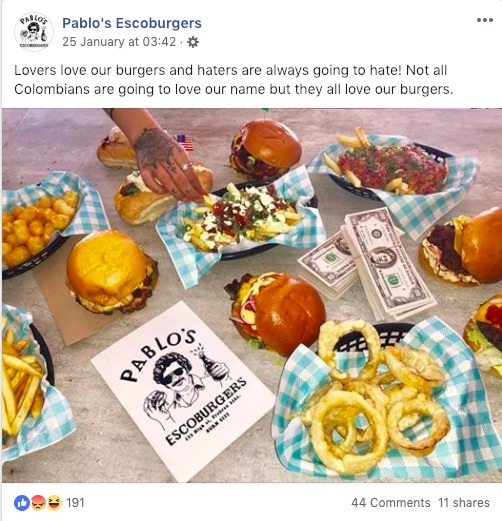 Lots of Colombians enjoy the burgers here, also a lot give us terrible reviews and upset comments on FB much the way Pablo himself would have if he was still here today. Take the high road people, put it to rest and learn to forgive and forget! Either way we love you all the same in a very “unpablo” way and know you will love our burgers. Enjoy! So, is this all just a bit of harmless fun, or an insensitive glamorisation of a dangerous individual? If you want friendly, confidential advice about drugs you can talk to FRANK. You can call 0300 123 6600, text 82111 or email via http://www.talktofrank.com/contact 24 hours a day, 365 days a year. Or Live Chat at http://www.talktofrank.com/livechat from 2pm-6pm any day of the week.